There are lots of big changes taking place at Catholic Charities of the Diocese of La Crosse's Eau Claire office lately. They range from the opening of Sojourner House for the homeless, to the restructuring of Emergency Services to the simple redecorating of the comfy space for clients. Thanks to Melissa Bowe, Director of Adoption Services for the Diocese of La Crosse, for introducing me to many of the staff and for her help in making the following article possible. 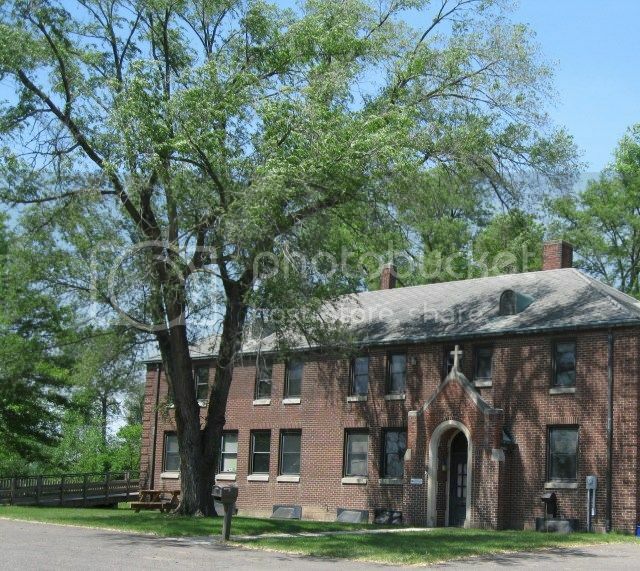 In brief, the Catholic Charities office in Eau Claire provides three main services to (and in the case of Sojourner House - with) the community. These are Adoption Services, St. Lawrence Community Services and Sojourner House. Pregnant moms discerning whether to keep their babies or make an adoption plan can get assistance at Catholic Charities' Eau Claire office. Eau Claire houses the "hub" or main office for adoption services for the entire Diocese of La Crosse and the Diocese of Superior (which does not provide adoption services). With the help of Catholic Charities offices in La Crosse and Wausau, the Eau Claire office covers a huge 35 county area in Wisconsin. Women concerned about their ability or willingness to care for the baby in their womb come seeking help at Catholic Charities. Melissa Bowe, Director of Adoption Services stated, "We talk about life options." Bowe and staff try to enable birth parents to make the best decision for their child, whether that may be finding an adopting family or overcoming the obstacles to keeping and parenting the babies themselves. "We spend hours with the expectant parents just to help them figure out what is the best option for them. And if it is parenting . . . great! We will do everything in our power to make sure that they succeed as a parent with their child." With the help provided through Catholic Charities Pregnancy Support Services, many moms-to-be do choose to parent their children. In 2011, on a diocese-wide basis, 47 expectant women sought help. 16 of those women placed their child for adoption. "We are here [for them] forever." Bowe adds, sharing the story of a woman they still hear from 14 years after placing her child for adoption. Catholic Charities also provides services to potential adoptive parents. In addition to babies available for adoption locally, they work with other adoption agencies all over the country, which adds to the choices for hopeful adoptive parents. Above is the Catholic Charities office on North Dewey Street, home to Adoption Services and St. Lawrence Community Services. Catholic Charities also is Hague Accredited which means they are certified to conduct home studies and placements from other countries. No matter the type of adoption, domestic or international, Catholic Charities will provide home studies, pre--adoptive education, matching, placements, and post--placement services for adoptions. Currently, Catholic Charities is assisting with a number of adoptions of children from Bulgaria. The adoptive children from this relatively poor country are all in orphanages and are unable to be adopted by other Bulgarians because they have been labeled as having "special needs". That wildly-inclusive term includes children with easy-to-cure medical conditions and those of gypsy descent. The adoption process can be nerve-wracking as hopeful parents wait for an adoptive baby. Even after a family and baby are matched and the baby is delivered, by law, the birth mother has until she terminates her parental rights at a court hearing to change her mind. Catholic Charities will support the birth mother's decision either way up until the final court order. Legal proceedings after the birth may take about six weeks, during which time the baby, the birth mother and the adoptive parents are in a difficult limbo. During those six weeks, the baby might stay with foster parents, specially trained and reserved to help Catholic Charities. Sometimes the hopeful adoptive parents act as temporary foster parents until the court hearing is completed. After that process, the child is permanently with the adoptive family and approximately 6 months later the adoption can be finalized. At that time, in the case of a "closed adoption", all information about both families is sealed away and is only able to be accessed through Wisconsin's Adoption Search Record. Almost all adoptions now are "open" which means the adoptive parents and the birth parents have some ongoing contact whether it takes the form of visits, letters or pictures. "Openness is driven by the expectant parent," Bowe explained. So they get to make the final decision about what kind of future contact there will be between the two families. Catholic Charities strongly encourages them to choose openness so that at least some basic information can be exchanged between birth and adoptive parents after the adoption. Besides being more convenient if questions arise, it can be a matter of life and death in the case of some genetic diseases. Facebook is providing an interesting new way for birth and adoptive parents to keep in touch. Accounts can be set up that are private for all but the two families. Young birth mothers seem to feel at home communicating in that way with adoptive parents and it relieves the problem of losing track of each other due to moves and life changes. After an adoption, help is provided through the Catholic Charities Post-adoption Resource Services program located in the same building. This program is funded by the state of Wisconsin to assist families who have adopted through Catholic Charities or any other agency. It provides resources, training, conferences, and special events to continue support for adoptive families through their life-long adoption journey. As Bowe emphasizes, "We are here to walk that journey with them." In March, the Eau Claire Catholic Charities office welcomed two new staff members for a re-organized community services program. 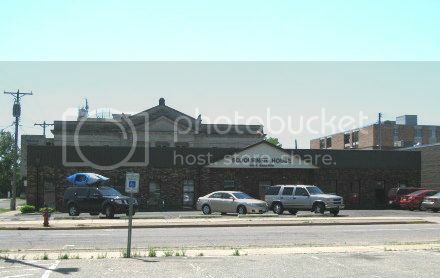 Prior to 2012, people could go to the office on North Dewey Street and request "Emergency Services." Those included instant help in the form of bus tokens, gas cards and clothing vouchers as available. They could also apply for assistance with rent, security deposits and utility bills by filling out a form and waiting for approval. A separate program and staff at Catholic Charities offered counseling in areas of financial/budgeting, housing and bankruptcy. Since the spring of 2012, all of the above has been merged into St. Lawrence Community Services. Help now comes with a conversation to assess the bigger picture and source of the problem. "We were looking for more of a long-term, permanent, sustainable solution," Dory Marshall, Financial Wellness Advocate, explains. "We could pay a bill this month but if next month you are in the same boat, in the same crisis, in the same situation . . . then we essentially haven't helped you." Another big change is that the place to go for walk-in assistance has moved from the main Catholic Charities office to Sojourner House. Between 9:30 AM and 12:30 PM on Tuesdays and Thursdays walk-ins are welcome, no appointment needed, first-come, first-served. Bus tokens and other immediate help is still available. Now, however, those with ongoing, repeat needs are given appointments for more in-depth financial counseling and long-term help. Mondays and Wednesdays in the main office are dedicated to that purpose. Above: Jennifer Kastner, Adoption and Pregnancy Support Social Worker, proudly poses in the newly decorated sitting room for clients. Earlier this year, the staff enjoyed picking out colors and designs to make it comfy and welcoming. Above: That is the Masonic Lodge peeking over the top of Sojourner House from a block away. Sojourner House, a temporary homeless shelter in Eau Claire for single men and women (other shelters in town serve families) broke a new record in July! The bad news is that the record of 1300 "sheltered stays," up from the usual monthly figure of around 1000, averages out to 42 people a night needing and using the shelter. The good news is that the Eau Claire community has risen up with great gusto to help with this need. According to Jeff Voss, Catholic Charities' Development Associate, Sojourner House is staffed by over 150 volunteers. They belong to more than 20 different local churches. Catholic Charities serves as administrator for the shelter. 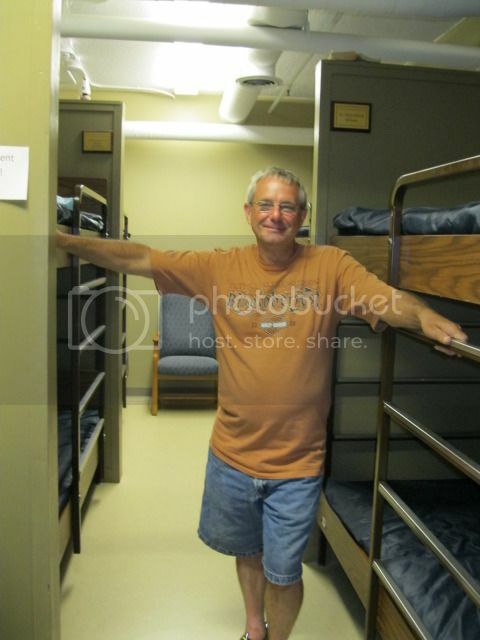 Sojourner House has sleeping bunks for 32 men and eight women. Overflow and special needs are handled with comfy chairs and recliners lining walls in seemingly every available, legal space. A special room with a door is available for those who come to the shelter intoxicated or unable to be around the other guests. No beds, just chairs in there, but it's a big improvement over a sub-freezing night on the street in winter. There are two washing machines and hospital scrubs have been donated for guests to borrow while they are literally washing the shirt off their back. There are separate sleeping areas, bathrooms and showers for men and women. There are televisions and computers with internet service. Churches have been providing an evening meal and there is food for the road in the morning. On my visit, Dan Robinson, Sojourner House Director, emphasized the cleanliness of the site and that that is how the guests left it that morning. No cleaning people had come in. And it was truly spotless with the exception of one book, place saved, that had been left on a less-desirable top bunk, perhaps for someone who was planning to come back again the next night. Here are some pictures of the inside of the building. Guests choose a bed number from the wall of plastic tubs when they arrive. They put the linens contained inside on their bed and their belongings into the numbered tub for safekeeping overnight. Robinson shows off the spotlessly clean sleeping quarters. 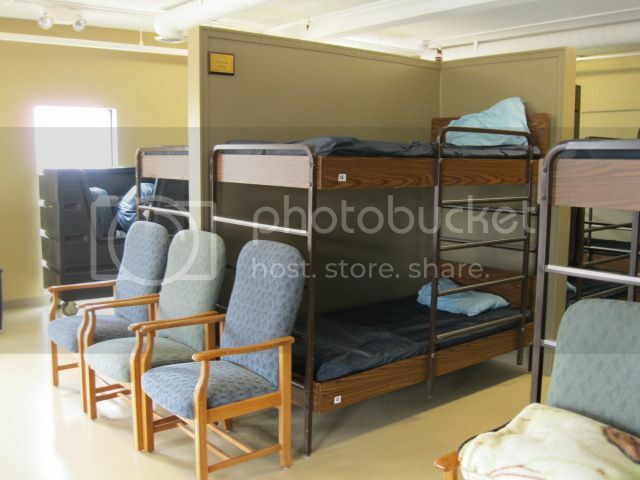 Note the plaques above each set of bunks. They recognize donors who gave $5000 or more to get the shelter open and running. 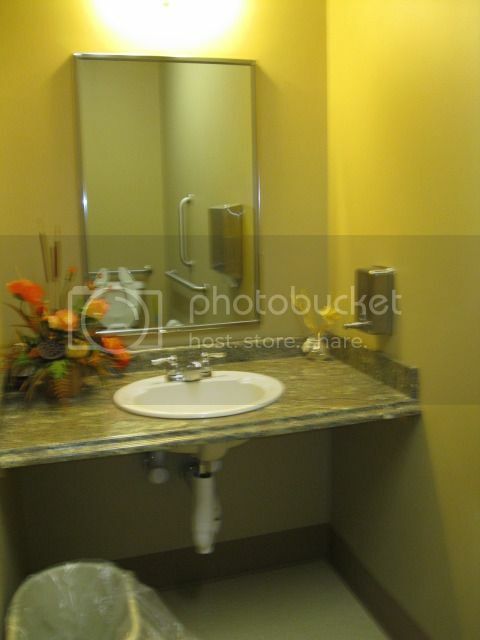 The women's bathroom is especially nicely decorated. 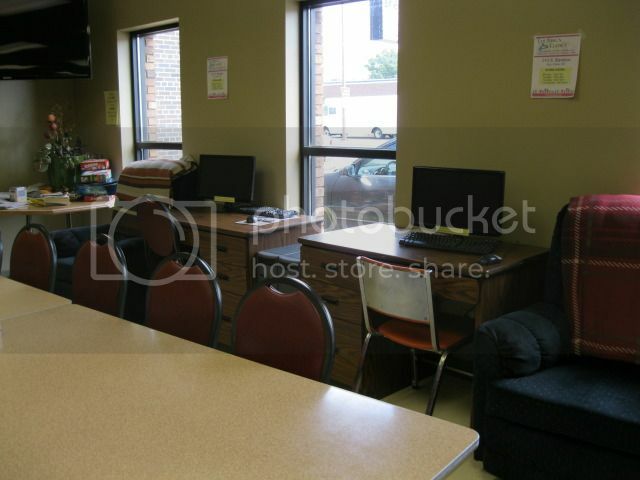 This picture shows the computers in the community room. This is the place where St. Lawrence Community Services gives assistance to those in need on Tuesday and Thursday mornings. This is the men's dorm room. Note all the chairs for evening sitting, or sleeping if necessary. 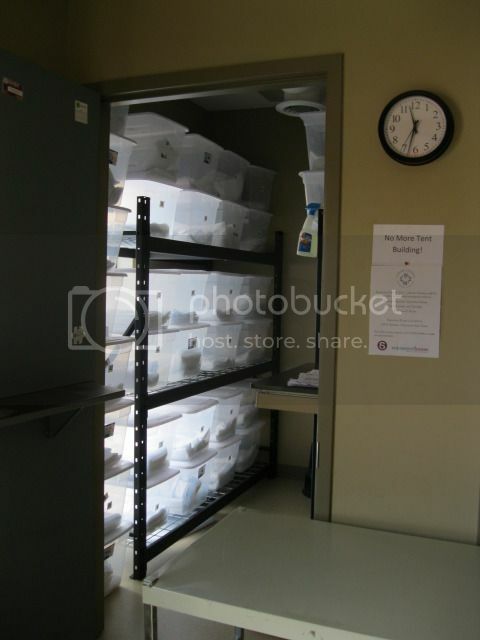 You may also be able to see that the dividers don't go all the way to the ceiling. As pleasant an option as this would seem to be for the homeless, there is very little privacy and you can only hope no one in the whole room snores!